"Egan manages to re-create so many small, seemingly unimportant facets of life which hold greater meanings"
This sounds really interesting and different from what I usually read -- I'm going to have to check it out. 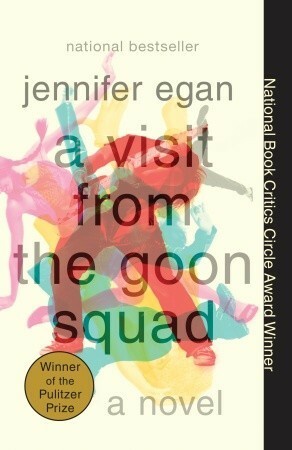 "A Visit from the Goon Squad never lags in pacing, but Egan’s creativity oozes out the pages, falling just under overwhelming." LOVE that line Keertana! I know just what you're talking about, and I love when an author seems to know when they're approaching the line to overwhelming and then switch directions just in time. Sounds like a truly fascinating read, thanks for putting it on my radar! Oh I wouldn't have even looked at this one if not for the review! Okay, you got me curious. I'm going to have to check out this author! Lovely review, Keertana. I wish that I had loved this as much as you do. I did like seeing how all the little stories pieced together but it was so darn depressing that it just left me feeling morose. Heidi, I know what you mean. It was definitely a morose tale but I continued to be so charmed by the style of the novel, not to mention curious about how each short story was going to contribute to the meaning of the work as a whole, that the sadness didn't dampen my mood and the depression didn't really hit. It happens with me when it comes to issue books in YA, but I managed to skip over it here. I have this on hold at the library, and your review has me anxious to get to it! I love when an author creates wonderfully complex characters and you find yourself hungry for any little extra overheard tidbit about their lives, even when they're not the focus of the chapter/story. What a beautiful line. ---> "And, most importantly, like a picture, it spoke a thousand words without uttering a sound." Stunning review, Keertana! Oh, this one sounds absolutely delightful! I would never have expected a novel like this to have such complex and deep characters. Books like that are a real treat because they just push the bounds and surprise you. Lovely review, Keertana! I don't know anything about this story, really. But these sentences peaked my interest "Ultimately, Egan manages to re-create so many small, seemingly unimportant facets of life which hold greater meanings. By the end, it is breath-taking to see all of the minuscule details come together with spellbinding ease. " That plus the promise of beautiful writing is very much intriguing. LOVE when an author can create great meaning out of small things, because that is how we see and connect to life in many ways. Great review!